♦ Föstudagsmyndin: Það var róleg og dálítið dularfull stemning í borginni í morgun. Almyrkvi á sólu var í dag, 20. mars 2015. Sólmyrkvinn hófst kl. 8:38, náði hámarki kl. 9:37 og lauk kl. 10:39. Myndin er tekin kl. 10:10 úti á Seltjarnarnesi. Hvar sem farið var um borgina stóð fólk úti í blíðviðrinu og horfði til himins. Góður dagur til að minnast þess að við erum geimverur! Næsti sólmyrkvi verður 12. ágúst 2026. Um sólmyrkvann í dag má til dæmis lesa á Stjörnufræðivefnum. ♦ Photo Friday: My, my, what a nice morning: solar eclipse in an absolutely wonderful weather! The pleasant weather alone was something to celebrate, after weeks and months of horrid blizzards. (And next storm coming in tonight). 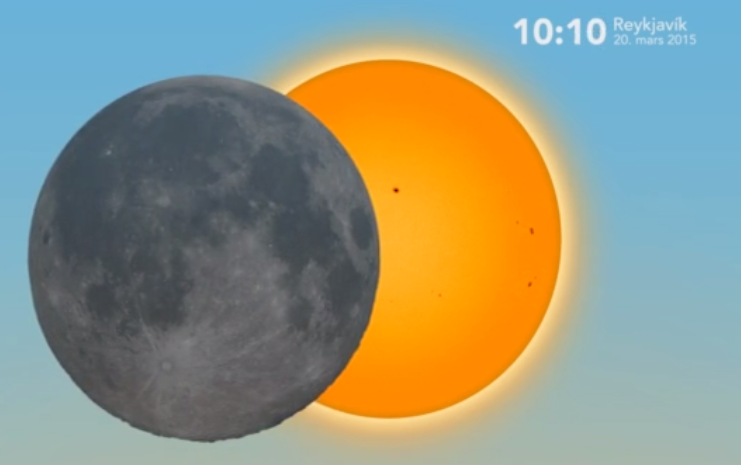 The photo above was taken at 10:10 am – where the moon’s position was about like that one on the image to the right. The atmosphere in the city was a bit odd, but definitely nice: calm and quiet and everyone out in the streets to stare at the sky, wearing crazy-looking glasses and clearly amusing themselves. We’ll have to wait 11 years for this to happen in Reykjavík again. 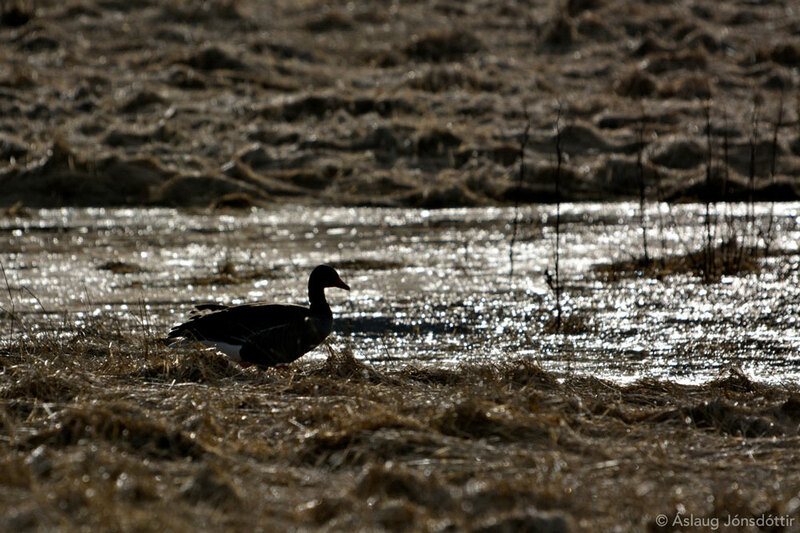 – Bewildered goose during solar eclipse, close to Grótta, Seltjarnarnes. 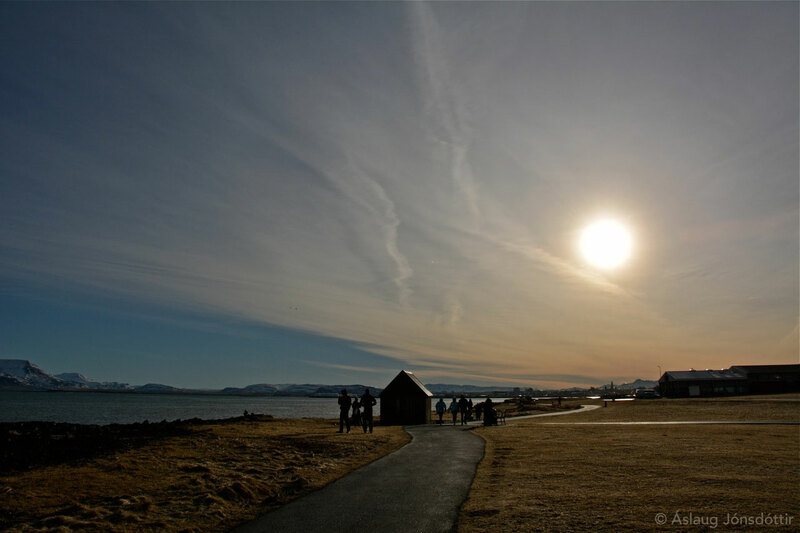 This entry was posted in ljósmyndun | photographs and tagged Áslaug Jónsdóttir, Iceland, ljósmyndir, photography, Sólmyrkvi, Solar Eclipse. Bookmark the permalink.